The majority of Alabama’s counties do not have enough primary care physicians to meet the needs of their residents. According to the federal definition of Health Professional Shortage Areas, 62 out of Alabama’s 67 counties are considered as having a primary care shortage. 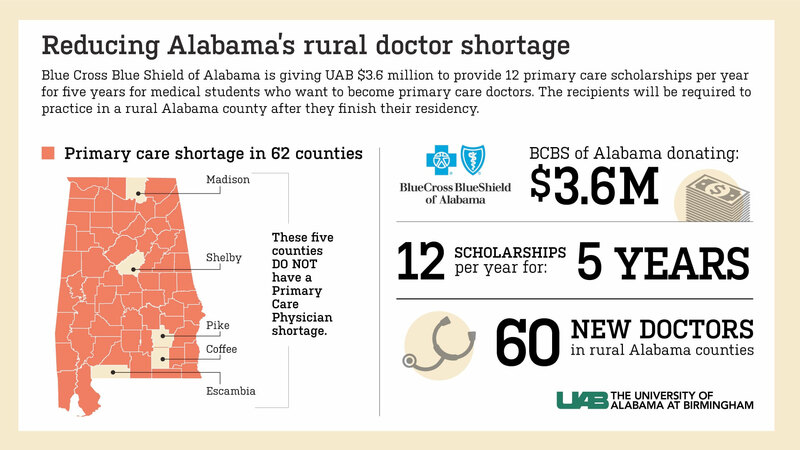 To help tackle the issue, the School of Medicine at the University of Alabama at Birmingham and Blue Cross Blue Shield of Alabama have created a program to increase the number of doctors practicing in rural parts of the state. The UAB School of Medicine is also home to two other rural medicine programs. The Rural Medical Scholars Program is based in Tuscaloosa and is conducted by the College of Community Health Science, a branch of the School of Medicine. The Rural Medicine Program is jointly sponsored by the School of Medicine and the College of Sciences and Mathematics at Auburn University.